What does "Stasi" actually mean? Why is text blackened out in the documents? Are there Stasi documents about me? How can I view them? How long does it take for a request to be processed? Did the State Security Service also keep records on people who were minors at the time? Can I view the files on another person? Can I receive information about whether my neighbour or colleague worked for the Stasi? The word is a colloquial term for state security, and refers to the former East German Ministry for State Security, abbreviated as MfS. The Stasi, or rather the MfS, was both intelligence service and secret police and it engaged in severe violations of civil and human rights. The SED, the governing state party in the GDR, used the Stasi as an instrument to systematically monitor its own population and to assert its claim to power through repression. The Ministry for State Security was founded by law on February 8, 1950. It was established out of the "Main Administration for the Protection of the National Economy," previously subordinate to the GDR Ministry of Internal Affairs. Wilhelm Zaisser was appointed the first Minister for State Security on the request of the Soviets. Karl Steinhoff, at the time GDR Minister of Internal Affairs, explained the need for this kind of ministry to the People’s Chamber: "The ministry is necessary to reliably protect national enterprises, agricultural goods and transportation from criminal elements, hostile agents, subversives, saboteurs and spies." A closer look reveals however that in actuality it was a military organ that had little to do with the GDR Council of Ministers: it was directly subordinate to the SED General Secretary, then called the First Secretary of the SED. The headquarters of the MfS were set up in Berlin. In addition there were also fifteen similarly-structured regional administrations, 209 district offices and seven on-site offices – (as of 1989). Their scope of duties affected almost every institution in the GDR: parties, social organisations, military, factories, hospitals, schools, universities, churches, cultural centres, and so on. 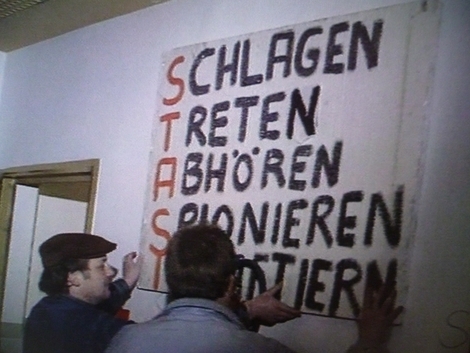 Looking back: Sign made by citizens storming the Stasi headquarters in Berlin on 15 January 1990: "Stasi stands for beatings, kicks, eavesdropping, spying and imprisonment." From the very beginning the MfS was the "Shield and Sword of the Party" – and at the same time an ancillary organ of the KGB, the Soviet secret service. To this end the MfS recruited "secret informers" and "secret employees" from the population, later referred to as "IMs" (unofficial employees), who operated conspiratorially under aliases. With its far-reaching authority, the Stasi systematically inspected the mail, observed and eavesdropped on citizens who were critical of the regime, broke into their apartments secretly, intimidated dissidents and "disrupted" opposition groups. In popular parlance the Stasi was also described as "Listen and Look," but it did more than just snoop. The MfS was also responsible for the criminal investigations of presumed enemies of the state, who were referred to in Stasi jargon as "hostile negative elements." Erich Mielke was appointed Minister of State Security in 1957 and ultimately held the rank of a military general. He remained in this position until November 7, 1989. His employees saw themselves as "Chekists" – a common term at the time for the secret police agencies in the eastern bloc that had modelled themselves in the tradition of the first Russian secret service chief, Feliks E. Dzierzynski. The Stasi regiment responsible for protecting the buildings of party, government and MfS was named after Dzierzynski in 1967. The term "Chekist" is derived from the Russian word "Tscheka", which was coined by Lenin in 1917. The abbreviation stood for "Tschreswytschainaja Komissija po borbe s Konterrewoljuzijej, spekulazijei i sabotaschem" (Extraordinary Commission for Combating Counter-Revolution and Sabotage). The MfS grew larger with each year. By 1988 it had more than 91,015 full-time employees and 189,000 unofficial collaborators who made it possible for all of East German society to be kept under total surveillance. During the course of the Peaceful Revolution, the GDR People’s Chamber passed the resolution calling for the MfS to be renamed the "Office of National Security" (AfNS) on 17 November 1989. Wolfgang Schwanitz, who until then had served as Mielke’s deputy, became its new director. But his position did not last long thanks to ongoing citizens’ protests. The offices of the MfS, now the AfNS offices, were occupied and the secret files found there were secured by citizens’ committees. The first building was occupied by civil-rights activists in Erfurt on 4 December 1989. These events culminated on 15 January when East German citizens stormed the Stasi headquarters in Berlin-Lichtenberg. In many places, however, the Stasi had already succeeded in destroying large amounts of files. In particular the department "HV A," the MfS office responsible foreign espionage, had been able to eliminate many of its records. Implementing a demand of the Central Round Table of the GDR, the disbandment of the Stasi was placed under civilian authority on 8 February 1990. Three people were assigned to this task: Werner Fischer from the Freedom and Human Rights Initiative; Georg Böhm from the Democratic Farmer’s Party; and Ulrich Schröter, head councillor of the consistory who served as representative of Bishop Gottfried Forck. To fulfil this task they were granted full powers of authority from the government. It was also resolved by the GDR Council of Ministers that "official documents and archival material […] should be placed under the control of the citizens committees." But the significance of this resolution remained ambivalent. The same resolution called for the formation of "a committee to serve as a centralised state organ to disband the former office of National Security." Its director, Günter Eichhorn, had previously served as department head in the GDR Finance Ministry and – it was later discovered – had for many years been an informer of the MfS. The headquarters of the Ministry for State Security in Berlin-Lichtenberg, located near the Magdalenenstrasse underground station occupied an entire residential block between Frankfurter Allee, Magdalenenstrasse, Normannenstrasse, Ruschestrasse and Gotlindestrasse. It included 30 buildings, many of which were connected underground. Today the Central Archive of the Stasi Records Agency and the Stasi Museum are located on these grounds. A law passed on 29 December 1991 set the legal procedures for allowing files to be viewed by the public. Protestors against the Secret Police at Alexanderplatz, 4th November 1989. All information found about you will be prepared so that you may view the documents or receive copies. In general, your right to view files refers only to the information that concerns you personally. Information about other concerned persons or third parties has to be rendered anonymous to protect their personal rights. For this reason certain text passages and in some cases entire pages of text will be blackened out. When original documents are viewed, the pages in question will either be covered or copies of the originals are provided with blackened out passages. If you want to find out whether the State Security Service collected information about you, please send a written request to the Federal Commissioner. Please use our request form (PDF, 893 KB, File is not barrier-free / accessible) and follow the instructions on filling it out. If you have questions, you can contact the access assistance for individuals. Within six months you will receive the first information about whether entries about you exist in the indexes of the State Security Service. Due to the increasing number of requests sent and the work involved in processing them, it can take up to two years before an applicant is able to view the records or receive copies. The staff of the Federal Commissioner is making efforts to reduce this waiting period. In general the State Security Service did not maintain records on children or teenagers. However, when a minor was suspected of being involved in a crime that the State Security Service believed to be politically motivated, it often investigated the entire family. Records on under age members of a family were only maintained when the child was the main reason for the investigation. Files might also have been kept on minors when the State Security Service engaged in recruitment efforts in the minors’ surroundings (e.g. in school). Information about another person is only provided when the applicant is a near relative of a person who is missing or deceased and the information sought serves a legitimate interest. Third-degree relatives may view files for the purposes designated in Art. 15 Para.1 Sentence 1 of the StUG. Let us advise you about whether your case meets the preconditions and what proof needs to be provided. No. Examinations to determine whether a person had been an employee or unofficial collaborator of the State Security Service are only conducted for a certain group of people on the basis of a written petition from a public or private agency. The lawmakers did not grant you as a private individual the right to receive information about whether the State Security Service kept records on other individuals or whether other individuals worked for the State Security Service.